It is called ‘the city that never sleeps’. To its 8 million inhabitants it’s just called home. Alicia Keys and Jay Z sang about it and now Louis Moinet gets in on the action with a timepiece featuring the skyline. We are of course talking about none other than the ‘Big Apple’ – New York City. 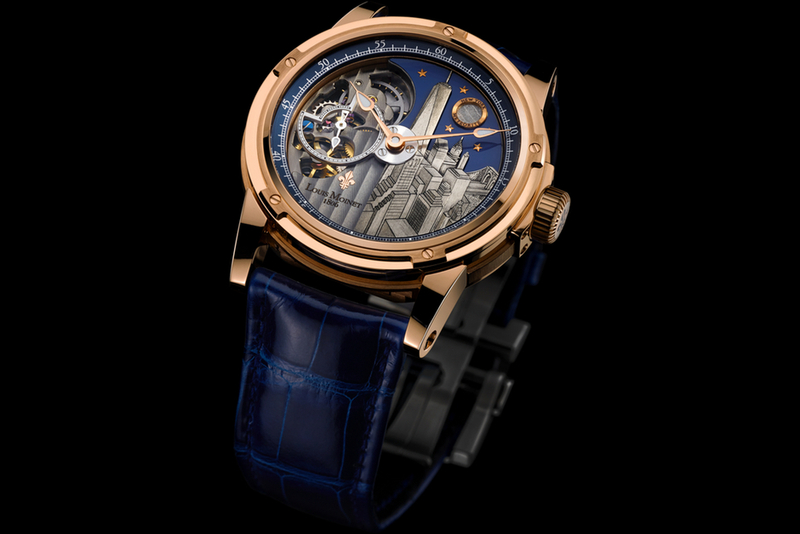 Introducing the Mecanograph from exclusive watchmaker Louis Moinet, which features a depiction of the skyline of New York. This timepiece is crafted from polished 18kt rose gold with a case diameter of 45mm. Louis Moinet also offers this model in a Grade 5 titanium casing for a stronger and lightweight alternative. Grade 5 titanium is the strongest and most hypoallergenic class of pure titanium on the market. This timepiece is made in a limited edition of 60 pieces worldwide in both editions. The detailing on the dial is simply spectacular with the central focus being the One World Trade Center, which is symbolic of this great city’s revival. The skyline is hand engraved, essentially making each piece unique. The dial also features a slice of the only meteorite to be named New York at the 1 position. The hands used are classic Louis Moinet with their unique Gouttes de Rosée shape. A t the 9 position is a small seconds counter which sits atop a large aperture showing off the movement. Naturally for a watch of this obvious class, Louis Moinet employs a sapphire crystal, which is highly scratch resistant. The movement used in this timepiece is self-winding, conceived by Louis Moinet and produced exclusively for them by Concepto. This automatic movement is COSC chronometer certified. Only 5% of Swiss watches are chronometer certified thus adding to the exclusivity of this gorgeous gent’s watch from Louis Monet. The oscillating rotor is bidirectional and features a handsome Côtes de Jura motif. The rotor rotates on a ceramic ball bearing, which is a high efficient, long lasting material. The oscillation count for the balance wheel stands at a constant 28,800 vibrations per hour. This movement, caliber LM31, carries a power reserve of 48 hours.